Johnny Richards with a big sea-run brown trout caught at the Rakaia River mouth. 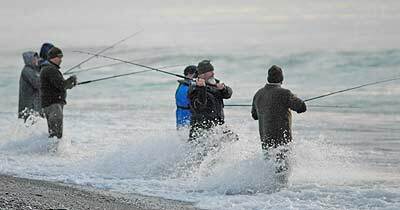 Surf fishing the Rakaia River mouth at first light for kahawai and sea-run brown trout. Some years the Rakaia River can experience unusually low flows over summer. During October and November we can expect at least one or two big floods to come down sweeping all before them, however, some years this doesn’t happen. The first salmon of the new season are usually caught sometime around late November. The salmon may be just waiting for a bit of colour to run up the river. Depending on the shape of the river mouth the salmon can sometimes be well out of casting range! But the lucky few always manage to catch an early season fish! 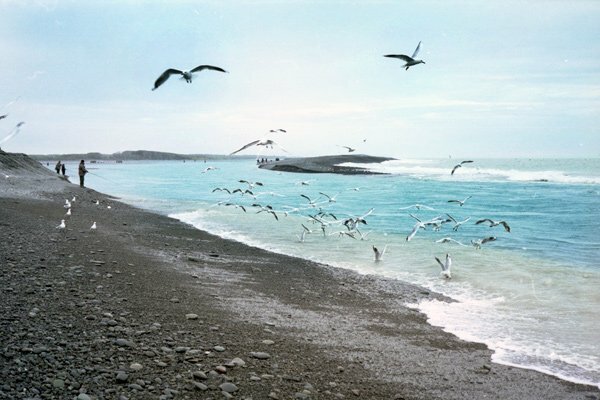 Seabirds diving for silveries (baitfish) at the mouth of the Rakaia River, Canterbury, New Zealand. There are certain to be large sea-run brown trout very close by after the silveries as well. A big Rakaia River mouth sea-run brown trout. Johnny Richards with a big sea-run brown trout caught at the Rakaia River mouth. From memory, I think it was taken on a feathered lure fished with spinning gear. Some years the mouth can be well down towards the North Rakaia Huts. This situation tends to cause flooding at North Rakaia Huts. Anglers coming from the south side may have to walk or ride up to five kilometres to get to the mouth proper, which gives you some idea just how wide the Rakaia River can be in its lower reaches. A decent fresh through the river will almost certainly punch a hole through this shingle barrier closer to the southern side. 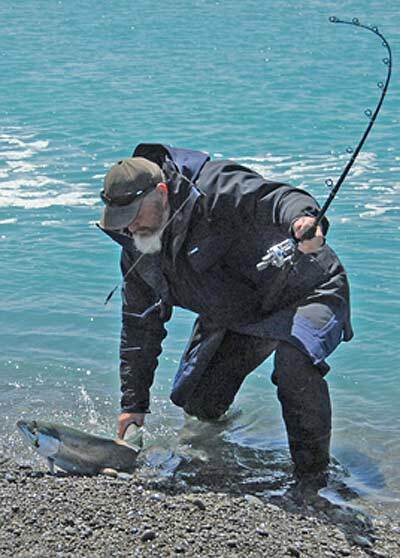 A powerful sea-run trout from the lower Rakaia River. Sea-run brown trout caught in the lower Rakaia River, the gut and the surf begin to build in numbers from October onwards. By Christmas, many are in magnificent condition. I would describe them as round bodied and torpedo like. They are surprisingly powerful fish. They pull hard and strong much like a salmon. Their considerable size and strength is no doubt attributable to their unlimited diet of silveries. These little cucumber smelling fish are present in the lower river, and the surf, in what must be countless millions. The trout are very well fed. These sea-run trout are not always easy to catch. For some reason, I seem to be foul hooking and releasing plenty of fish. Whereas I hardly ever foul hook a trout when fishing the slower, less boisterous water of the lower Waimakariri River. Overall I’d say that the Rakaia River mouth takes much more effort to fish than the more sedate Waimakariri to the north. The mouth of the Rakaia River seems to change shape with almost every rise and fall of the tide. The place seems to have a wildlife of its own somehow. Fishing it is exciting but requires different gear. 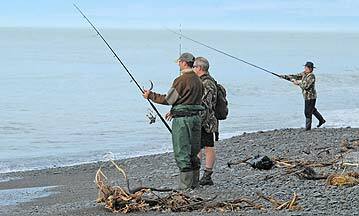 Many anglers fish the lower Waimakariri River with Rapalas and a range of other lures, whereas the faster, deeper water of the Rakaia Mouth makes feathered lures taken down with a lead weight up the line the only effective fishing method in most instances. The Rakaia River mouth is much more difficult to access. Without a four-wheel-drive vehicle or a quad bike in can mean a long walk there and back over loose shingle. Rakaia River mouth at dawn on the 6th of December 2009 looking towards Banks Peninsula some 45km to the east. Watch for birds working close in to shore and particularly along the sides of the gut. If schooling silveries (smelt) are present, and birds are working them, trout and kahawai are sure to be there even if sometimes they aren’t chasing the baitfish to the surface. It is always worth casting your lures despite what some of the experts might say. The first push of the new tide, all the way to the top of the tide, are the best times to fish, but sea-run trout can be taken on any part of the tide – particularly if birds are working bait-fish the trout will be close by. It might seem a bit odd to fish for trout in the sea. But you can most definitely catch sea-run brown trout in the sea off a river mouth – and particularly in the sea off the mouth of the Rakaia River. Gulls and terns above vast schools of silveries in the surf zone off the Rakaia River mouth. Sea-run trout and kahawai work these schools day and night both in the sea and in the lower river. The trout and kahawai chase the little fish up to the surface where the birds are waiting! You can see the difference in colours where the sea and river mix together. The Hopes Silvery pattern is a good match for the real thing but a Yellow Rabbit may be a better option with so many silveries present! The best colour lures seem to be those with a bit of yellow in them. Yellow Rabbits are a good choice. I prefer Hopes Silvery patterns as these look the most like a silvery bait-fish if we are “matching the hatch,” however several top local anglers are using the yellow coloured patterns very successfully. Perhaps the Hopes pattern looks too much like a silvery whereas the different yellow coloured lures tend to attract the predators’ attention more readily. New Zealand Fishing Flies. Some anglers report better success fishing for the sea-run trout after dark. 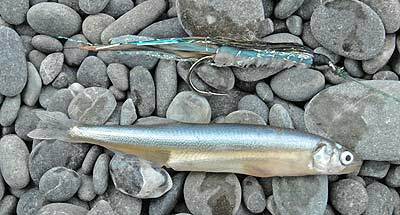 With the river very clear and low trying a smaller lure is also worth a go. However with so many silveries present in such clear water at the moment I guess the trout can afford to pick and choose which ones to chase! Cleaning an early morning kahawai caught fishing in the surf. The best time of day to fish the surf is just after first light at five in the morning. We don’t always think of trout as a sea fish but plenty of big sea-run trout are being caught in the breakers and just behind them on the south side of the mouth. Sea fishing on the north side can be too dangerous. The spit is narrow and big sweepers pass over it regularly. The tip of the north side spit is rightly known as Suicide Point. 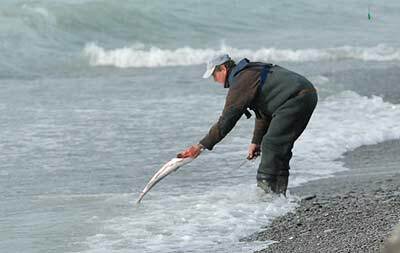 With several fatalities and near misses in recent years on both sides I note that many Rakaia River whitebaiters and anglers are now wearing life jackets both for whitebaiting and fishing the spit and lower river. This is a good thing to see. A life jacket, or rapidly inflatable buoyancy aid, is a worthwhile investment if you plan to fish this area. The sea at South Rakaia isn’t always this calm. Video below: Here is a short video filmed at the mouth of the Rakaia River. It shows one of the temporary islands that form at the end of the shingle spit. These islands are exposed as the tide recedes. They can last from a few days to a few weeks before being eroded away by the sea.